Green Fairy Quilts: It's my first GIVEAWAY! So, I love Shangri La by 3 Sisters for Moda, when the fabric came out I had to have it. I designed my quilt pattern "Judi's Album" and my bag pattern "Quilted Bag" using the fabric. I just can't get enough of this fabric. So, when thinking of doing my first giveaway, naturally I chose a theme centered on the fabric I love. Here's the deal- I want to give away this quilted bag! I made a few of these bags because I just couldn't help myself and I have one left. As you can see the bag is beautiful. What do you need to do to get this bag? Post a comment and tell me your name and where you are from, check out my patterns here and tell me which one is your favorite and what you like about it, then tell me why you want my quilted bag. Tell your friends and put this post on your blog and you will have 5 entries for the drawing. Oh, you have until Monday, February 2. I will announce the winner on February 4th! One more thing, I am throwing in the yard of fabric and two fat quarter bundles. Let's hope my first giveaway will be a success! Leave a comment, tell your friends! That is SO cool Judi! I LOVE my bag in that print. In fact, I was at the store yesterday and a lady couldn't believe how cute it was. She couldn't believe someone made it! You have such an amazing talent! Way to go. Hi Judi!! Great giveaway and I hope to help get the word to your site (but that ruins my chances to win that gorgeous bag and I LOVE that you are including that extra fabric). Morning Bloom is your pattern that caught my eye the first time I discovered you. It is the type of pattern that allows the fabric to speak for itself and I for many of us who like to use wool the flowers are perfect for that. My pleading reason for wanting to win the bag....and doggone it I was going to mention the cute bag to you before but didn't....is it is the type of bag I would love to carry to quilt shows for my purchases. I mean, great fabric choice of color and size looks perfect. Did I ramble? I wanna win! OK....time to post you at my blog and limit my chances of winning. Mary from Quilt Hollow sent me your way! Love the fabrics and the bags are so cute. You are so very talented and generous. But then all quilters seem to be this way. what a fabulous giveaway! please include me in the draw? looked at your patterns and my two favourites would have to be the autumn harvest wall hanging because the colours are stunning and i love autumn, and the paisley park quilt because it would go beautifully in my bedroom. i've put your giveaway on the sidebar of my blog. thanks for offering such a fantastic giveaway! I love you patterns! Can't decide between three which one is my favorite....Sail Away under the Boys as I grew up on the Chesapeake Bay. Crazy Daisy under the Girls as I have ALWAYS LOVED daisies. And under the wall hangings the Life of a Snowman...as I LOVE SNOW! I love the bag you are giving away. I would be perfect with a top and quilt vest I have. I'll be posting about it on my blog later today. I love your patterns, they all look quite complex but seem like the are quick and easy. I especially like the Butterfly Fields pattern, what lovely colors! Great giveaway - I just love Grandma's Trellis - seems to be an updated version of an old favorite. Oh I so want that bag. I love life of a snowman, Country garden, Carrots and Peas, craisy daisy, brown and pink spring and butterfly fields. I am from Idaho, and have been a long time admirer of your talent, I don't sew myself...Hanging head in shame. Why do I want your bag..?? :o)It would be a perfect gift for one of my wonderful friend ...it is her colours and she is so sweet to me..
Good luck to all from Stina in Sweden!! My favorite of your patterns is the Craisy Daisy! My favorite color is green....is yours too? My name is Betsy and I live in Florida. I love the snowman wallhanging because it does not snow in florida so that is the closest i will ever get to one. I aldo do lots of applique. do we have to pick just one thing we loved about that site? Well...I picked the boy patterns and loved them all but the Sailboat one was my favorite. I truly did like your store, I will be back to visit it again. The tote is awesome...I have a friend on the island, we get together often and make totes, we are planning a class right now. Your bag is lovely -- I happen to love all of the colors in Shangrila, and find myself coming back to them again and again. I came to your blog through Mary at Quilt Hollow. I came to HER web site from Kimberly Einmo's site. Isn't this all starting to sound like the "begats" in the Bible? Anyway, thank you for the eye candy -- I will certainly be back. Oh, I'm fond of that Rick the Rack quilt! I'd love to try it in some of Lila Tueller's fabrics. I think the bag is great and would love it to put some of my traveling quilting things. My name is Karen and I'm from Arkansas. I love the quilt pattern Crazy Daisy. I will put you on my blog. Hi! I'm Amy from Utah and my favorite pattern is Stars and Stripes. I would love your bag because the quilting is gorgeous and I also love Shangri-La. :)I will blog about you too. I'm Sue from Darwin - at the top of Australia.Coming from a family of sailors - I love "Sail Away" the pattern and material work so well. I love bags - can't get enought. I've just started making my own, but yours is beautiful. Hey Judi! Count me in, I'm a Shangri-la fanatic! Love the bag! My favorite pattern of yours? Tough to choose, but I'm thinking Summers End. It looks so fun to piece. Thanks a bunch! Posting about this right now... Oh, and I'm Camille, and I'm from Idaho. And Las Vegas... sorta. Really cute bag! My name is Melissa and I am in Alpine, UT. My favorite of your quilts patterns is Froggie goes a courtin'. I love the colors in the quilt and design. If I had a little boy I would so make this quilt for him! Hi! I came here from Camille's blog, and my name is Diane. I'm also from Idaho. My favorite pattern is Sail Away! It looks vintage and adorable! I think the colors in your bag are lush and provocative. Thanks for offering the giveaway! Hi, I'm Margaret from Westchester, New York. I just discovered you! I love your Judi's Album quilt on your bed! I also love the Grandma's Trellis quilt. Gorgeous! As to why I want to win your bag, well, what don't I like about it! 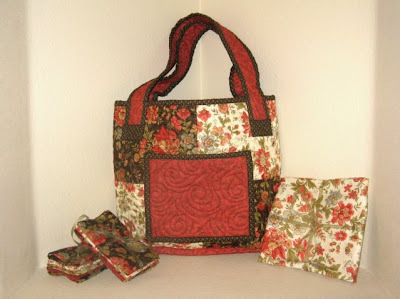 I love the colors, I love the wide handles, I love the quilting, I just love it! Thanks for the chance to win. Wish I had a blog so I could post about it! I love this cute bag! My name is Katie Winn and I live in Laveen,AZ. We have four great kids, and I love to quilt. My favorite pattern on your site is the Sail Away. Congratulations on your first giveaway! I am posting this on our blog, so checkit it out, and I'd be happy to have 5 more entries. Hi...I'm Joan from Fort Wayne, Indiana. It is a tie for my favorite pattern...between checkered cherries and checkered flowers. I love them because they are so fun and because of the combination of piecing and applique. I think the bag you are giving away is gorgeous. I would love to have it simply because it is so beautiful! Hi! My name is Jennifer and I'm from BC, Canada. I was sent here by Camille, and I have to say I 'third' the Shangri-la love. Your bag is adorable! I use cloth bags for so many things, but yours is too pretty to take to the grocery store or library. Maybe I'll keep it around the house for one of my 'one-to-go' knitting or embroidery projects. After checking out your patterns, I'm really liking either of the 'checkered' quilts. I think gingham is super cute, and I had never thought to give a quilt a gingham look just by careful fabric selection - amazing! Oh my goodness...I am a huge Shangri-la fan too! I am from Minnesota, I have 2 favorite patterns from you site. The quilted bag pattern/bag is awesome and I love bags. Combine Shangri-La and a bag and I'm in quilter's heaven. I also love the Craisy Daisy quilt. It reminds me that spring is not so far away anymore. Hi, I'm Jacque from South Carolina! I got here from Mary's QUiltHollow blog...and am I glad I came! Your patterns and color choices are really inspiring to a newbie like me - been sewing kids clothes and costumes for almost 25years, but only quilting for about two years. I really like your Stars and Stripes boy quilt pattern, and the bag is beautiful - very different and unique from other tote bags I have seen. As a marketing/graphics consultant, I have to tell you I love your site! It is refreshingly different! I am grateful to all the quilters who blog - you inspire the rest of us to do more and do it better! I love life of snowman... I'm from Pennsylvania and it is snowing here. Thanks for the giveaway. 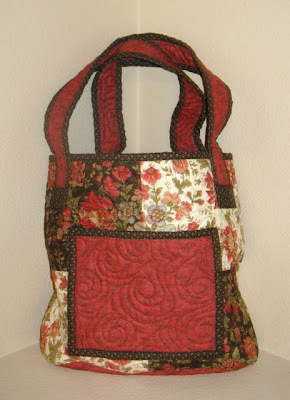 What a great bag and I am new to the 3 sisters fan club, but I love that fabric!!! 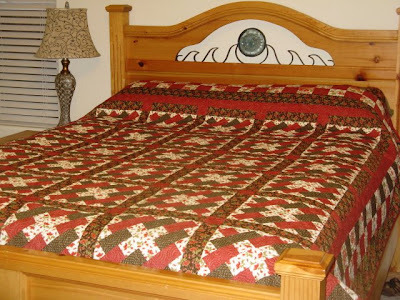 I am Debbie from Dayton, Tennessee...my favorite pattern, love the quilts within a quilt!!! I saw your give away on Camille's blog and had to check it out...since I love Shangrila too! I am here via Camille's blog. I love the Quilted Memories pattern and Craisy Daisies, too. The bag is beautiful. I'm Renee from SC. Nice to 'meet' you. Judi, I too saw your give away on Camille's blog...Lord, I just keep finding wonderful new blogs to explore and less time to quilt because there are so many delightful things on the blogs. I'm Nancy from Utah (the frozen northern sector **pay no attention to the chattering teeth you hear, they are mine, I just can't get warm**) Picking out my favorite quilt was a true chore. They are all wonderful but my eye kept wandering between Butterfly Fields, Summer's End and Judi's Album, however, when I look at the picture of the finished Judi's Album on the bed, I just fell in love with it. Absolutely beautiful and hands down my favorite. Now, as for why I want the Quitled Bag, well, what can I say, I can't think of anyone I know who wouldn't want it. It is really wonderful. Talk about going to a quilting class in style!!! Well, sadly I don't have a blog to post on. I just wander this wonderland of blogs and drool. Lastly, I want to wish everyone hoping to win this great give away 'Good Luck'. I can't help but root for anyone who quilts. Favorite Pattern: Crazy Daisy & Checkered Flowers due to their simplistic beauty. Great giveaway! Congratulations on hosting your first giveaway! Good luck everyone! Great giveaway! I love the bag - it is beautiful! I have been wanting to attempt making a bag but haven't gotten up my nerve yet. All your patterns are adorable - but I am really drawn to the stars and stripes one. I just found you...and I'm so glad! !My name is Dawn and I'm a quiltaholic..oops, wrong group...I'm from a small town in Southern Nevada. Why do I want your bag?...cause a girl can't have enough bags!! the bag is beautiful and you are right the fabric is wonderful: these are my colors. And if I won it I wouldn't have to make myself one to carry my laptop in, like a briefcase. I currently am using a jeans bag I made about 6 years ago so I need a new one. And how very creative you are. My favorite of your patterns is "Life of a Snowman." I really like wall hangings that tell a story. Hi There! I'm from Toronto, Canada. My first visit to your blog and your now on my favourites list. All your patterns are lovely but I love the progression on the Life of Snowman best. I would really like the bag because I've been making bags like crazy lately and have given them all away as gifts and would love this one for myself. Love your bag and the fabric! I also like the Crazy Daisy pattern as it is perfect for a little girl, and would be cute in so many different color combinations. So happy to have stumbled on to your site! I found you by way of Camille's Simplify blog. It's hard to pick but I think my favorite pattern is Paisley Park! I really love how all the design elements play together! Hi I'm Sandra (usually called Sam) from Perth in Western Australia - the most isolated city in the world, and I have been quilting for about 6 years. I really love your Micah's quilt because of the juxtoposition (now there's a word you don't get to use often) of fabrics. I would never dream of putting those fabrics together - too conventional at heart - and yet they look terrific. I would love the bag because at the group I attend so many of the ladies have similar bags and I don't have one, and life is just so hectic I never get a chance to make one. Also, the colours are beautiful - the sort I would chose for myself. I'm LaTeaDah from Gracious Hospitality (PNW). I love your blog! And it was very hard to choose a favorite pattern --- they are all beautiful. My, oh my, they are VERY beautiful. I finally chose Carrots and Peas because I like the traditional repetition and the light colors. I would love to be entered into a drawing for your cool bag! I love MODA! My name is Jennifer from Wisconsin. I found you through Camille Roskelley's blog. I really like the checker blossoms & the butterfly mania quilts. They both have a sense of whimsy about them that takes me back to childhood. I would love your quilted bag. What's not to love about it? It looks like the perfect quilted bag! My name is Jessica and I'm from Provo, UT. I love the Celebrate America quilt pattern because I'm proud to be red, white and blue and I just love the stars! The quilted bag is so cute and would be the perfect all around bag. Thanks for the great giveaway! I love Shangri La, which is another great reason to love your bag. My favorite quilt pattern is Craisy Daisy, but all of them are adorable. I'm Angie, currently in Hawaii. Thanks! Hi, my name is Joyce and I'm from Ohio. My favorite pattern is Craisy Daisy. It's so fresh and springlike. With all this horrible winter weather, it's like a breath of fresh air. Ilove your quilted bag. I'd use it take my projects to quilt guild! I don't own a quilted bag! Thanks for entering me in your giveaway. OMG that's a beautiful give away...please do add me as well. I liked the Checkered Cherries pattern. What a wonderful bag, what a wonderful giveaway. I checked out the patterns, and if I really had to pick a favourite, I'll choose the brown and pink spring. It's nice, it's different and the colours look good together. Why do I want the bag? Cause I like it, and who wouldn't like to carry such an attractive bag around, and big enough for lots. Thanks for the great giveaway!! What a beautiufl and generous giveaway. My name is Della, I'm from Ohio, I adore your site and my favorite pattern is "Life of a Snowman". One can never have too much snow...well in my opinion. I would like to win because I love the bag and the fabric and it is something I would be proud to carry. Thanks. Brown and Pink Spring for sure! And it looks easy enough that I could even attempt it! All your work is amazing I'm adding you to my favourites! I love the bag and the fabric. I had a hard time figuring out which pattern would be my favorite they all look like fun, but I guess I have a thing for snowmen so I'd have to pick the life of a snowman as my fav for now. Hi, Gene Black here from Anniston, Alabama. I really can't decide on a favorite between "Grace" and "Square Chase." If I have to decide I would say "Square Chase." I will be blogging this so check my blog and see! I want the bag because it is gorgeous and would be great to replace the cheapo backpack bag that I am carrying my handwork project in. The hand work is for filling spare minutes with creativity. Currently it has my yo-yo project in it. That nice pocket on the front would be great for scissors and thread. Hi, my name is Jessie and I am from Charleston, SC. I just found your blog and I love all your patterns!! They are so sweet it is hard to choose, but I think I'm gonna say turtle walk is my favorite! I have always loved turtles and that quilt is just too cute! My name is Stephanie and I'm from Pennsylvania! I checked out your patterns and I love Butterfly Mania....probably because all three of my girls would LOVE it too! Hello - my name is Mary and I am from Minnesota. My favorite pattern of yours is Turtle Walk because of the great design and the colors used on the pattern cover are great. I would love to win the bag because I have always liked this fabric line but have yet to make anything out of it. Both your quilt and bag showcase the fabric so well. I'm ready to try my first bag. I made my first "all by myself quilt" over Christmas! Meaning my uber-talented sister wasn't here to guide all my steps. Bet you loved the comment from Keith! I guess I didn't read all the requirements! So here is the correct info. I would love the bag so I could carry my own computer on vacation to Cancun, where we currently are. Then I could look at blogs and enter a cute giveaway and mention my favorite quilt pattern crazy daisy. Then I could fly home to Las Vegas and cross my fingers that when I log into my own computer I will have an email that says "Guess what Keith? You won a quilt giveaway!" What a great giveaway! The fabrics are beautiful and the bag is so lovely! I would love to be the winner!!! My name is Suzie and I from Germany. Thanks! I'll be back for sure. GREAT BAG. My name is Janet. Great bag Judi! I would love to win it. I never get around to making myself a bag. I love your album quilt and pattern. I enjoy vintage looking quilts. All your aptterns are darling! I want to win your bag because it is a really simple bag!!!!!!! I bet it can hold a lot of stuff!!! Great Give-a-way! I love the Turtle Walk. It would make such a fun, bright colored quilt. The bag is adorable, and you are right that fabric line is very classic... love it. I am Jasey from Montana. I am adding a link right now!!! Thanks for the giveaway! My favorite pattern is Carrots and Peas. I like simple designs that are made special by the fabric choice. The tote bag is lovely and would make a beautiful take home and grade papers bag. I promise it will get lots of use. Choose a favorite? Impossible! But if you're going to make me I'd have to say Morning Bloom. I live at the base of Mt. Hood in Oregon. Everyone needs lots of bags. I love sewing them. I'll post a link on my next post. Keep sewing! Come visit me at thisoldbatt.blogspot.com. I love love this giveaway because the bag is such a great prize! I really like the fabrics together and the stippling pattern is great!! Anyhow... my name is Leslie and I am from good ol' northern michigan where it's nice and cold!!! I really love the butterfly mania quilt becuase it's just so sweet. Love it! I really hope I win!! Ohh an I linked this giveaway to my blog!! I just "discovered" your blog! I love giveaways....who wouldn't if it involves fabric? I suppose my favorite quilt pattern would have to be Brown and Pink Spring...I believe because I've always liked the color combo of pink and brown. The bag would be a great addition to either holding my knitting supplies or quilt supplies or scrapbooking supplies....depending on which activity I'm "traveling" to. I'll try to post to our family blog...but I'll let you know if I get to it! I would love to win your bag simply because it is beautiful and I love Shangri-la too. Micah's quilt is my favourite pattern ... I have a 10 year old nephew called Micah and he loves dinosours! I followed the link from Camille. You have a lovely blog. What a wonderful bag. My name is Dawn and I"m from IL. That quilted bag is beautiful, but I"m really in love with your Judi's Album quilt. That has to be my favorite pattern of yours, although Summer's End is a close second. Why do I want your bag? Well who wouldn't, the fabrics are gorgeous and doesn't every girl need a great bag to use for EVERYTHING! Hi I'm Rhonda from Maine. What a beautiful quilted bag! My Mom is in eldercare housing and has been bugging me to find her a quilted bag. Her roomate has one and she loves it. So here I am! LOL I checked out your patterns and I just love the Fun with Triangles. Thats awesome...it seems to change even as you are looking at it! Thanks for the chance to win the bag. http://dun4fun-hondaray6.blogspot.com/ and emailed to my quilting friends! Much success to you! Hi Judi! I'm Chantie from St. George, Utah, and your pattern "Quilts Within A Quilt" is the one I want to give a try. It looks like just the right challenge! I'd love to win your bag because I adore bags and making them, and I don't have anything in the Shangri La line (should I admit that?!) although I love all things Moda. Thanks--you have a great blog! Hello I'm Margaret from UK but now living in Spain. Having looked at your patterns I'd have to say the Brown and Pink Spring is my favourite. I love the look of brown and pink together, Spring is my favourite season and applique my favourite technige. I like to make bags so of course I love the bag pattern too. If I don't win it I think I may just have to buy it! Thanks for the chance to win such a fabulous giveaway. I've put the link and picture in my blog sidebar. What a beautiful quilt. Thank you so much for letting me enter that divine bag! I love Butterfly Fairies because it looks so pretty. I think the bag you are giving away is divine as I love the colors! Gorgeous quilting you do..
My name is Sandy--I live in California. Dancing Diagonals is my favorite pattern and I would love to win your bad because it is sooooo beautiful! Hi!I came here through Margaret's (solstitchs) blog, and found your wonderful giveaway!! I can't quilt, but I always admire who can quilt well!! Your works are so gorgeous, and everythings perfect!! Hi, It's Snoodlz again - I saw your note to us nonbloggers, and if you pick me, just send a note to jacquebruce@yahoo.com !! Love your lil bookbag you posted, too! I love the pattern "brown and pink spring". It would be darling in my baby's room. And the bag is adorable, I'm already imagining all my supplies loaded in. Okay, so I LOVE your Stars and Stripes pattern!!! I have a 6 year old boy that gets ignored when it comes to quilts, mainly because there are so many cute girl quilts out there, but this one is perfect! I'd love the bag because I also LOVE Shangri La! I saw a pinwheel quilt that someone made out of it and ever since I have been wanting to make one just like it. Good choice of fabrics! Hi, I'm Frou in Melbourne Australia, found you via the Simplify blog. Love your Quilt within in a quilt pattern, mostly 'cause it playing simple shapes and colour... have bookmarked that to revisit. Would love the bag, because I too love Shangri la fabrics but came to them a bit late here in Australia, really hard to find. Have just managed to track down a second jelly roll so I can start Truly Scrumptious, a stitchery quilt designed by Cinderberry Stitches that uses Shangri La. Hi Judi, what a gorgeous give away. You are so generous. My name is Jossie and I live in the Netherlands. Arrived here from Louanne's. The design I like best is Rick the Rack. Can't tell you why, it just gets me. And why would I like to win that fabulous bag of yours? Because it is made with love and gorgeous fabrics. I can imagine me walking around with it. What a lovely bag! I would love to win that one - and I am of course telling my visitors on my blog too! I think your patterns are very pretty, and you gave me a hard time finding a favorite - but I love quilts with hearts so my choice will be "Liliana's Heart" which somewhat resembles a quilt I did the other day. I'll be back to check your blog lots of times! I am new to Blogging and I love your bag. That fabric matches just about everything I have in my bedroom. Since the very 1st quilt store I went into I have always picked out something that was by Moda. It is my favorite of all fabrics. All collections.I am a nurse and I need a bag to carry my hand work to work on in down time as well as diabetes testing supplies and wallet. I could use a new tote NOW. I have been looking for one I like and I just found it. My favorite pattern is the pink/brown quilt because it reminds me of my grand daughter who loves pink. I hope to be in your drawing and will post a following on my site. Hi, my name is Rita and I live in AZ. I checked out your patterns and my favorite is Craisy Daisy since Daisies are one of my most favorite flowers. Your bag is so pretty and it would be perfect for my stitching projects I take in the car when we go visit the grandchildren. HI, I'm Robin from Kimberly, Al. I love your patterns, they are way too cool! My fav is Stars and Stripes. I love to use Americana in decorating but STARS are my latest addiction. thanks and I'll keep my fingers crossed that I'll be a lucky winner! What a great giveaway! Okay, my blog name is Shasta and I am from Ohio. Of your patterns I like the butterfly one the best because it makes me think of spring, when I can get away from all the snow and ice here. I want the quilted bag because it is beautiful, and I can use it to tote my library books, and/or things I need to take to work, and I can take it to a quilt store or a drug store and use it instead of getting a plastic bag, etc. bellissime creazioni , la borsa molto bella . I love the Celebrate of the 4th of July, because it remains me of the big celebrating I had last summer in Cody Wyoming together with our relatives, just the 4th of July. It was an fantastic experience! I will be happy if I have the hapiness of winning your bag. I do not think I can do one like that! Even if I want to! Jane S and I live in Sweden. Oh my gosh that was hard! I like Autumn Harvest for the randomness of the leaves and I love the Stars and Strip pattern, well, because I love stars!! Being a military family I seem to always have them somewhere in my life. I too have given my shot at quilting. I'm such a visual person that sometimes seeing a finished product may be helpful to me. It would just be awesome if I won that gorgeous bag! Thanks for doing the give away! I am originally from Tyler, Texas but my husband currently holds orders in Arlington, WA. Hi, I'm Judie from Maine and was sent to your site from my friend LYNN. All the patterns on your site are great, but the one I like best is the "life of a snowman" I live in an elderly complex and we decorate the walls outside our doors. this would be perfect for the whole Winter season. Happy Sunday, Judi! Iva from Kansas.... What a terrific giveaway. I would love to win the bag because it's cute, it's in my favorite colors, and it would be great for carrying small projects. You have lots of fabulous patterns, but since I have to choose would have to say that Butterfly Fields is my favorite. I love your designs especially Brown and Pink Spring. Brown and pink are my two favourite colours and putting them together is just perfect. I love the way the brown squares are not completely closed up as it makes me feel that its a garden full of flowerbeds and you can just meander dreamily from one flowerbed to another drifting through the little gaps. Thanks so much for entering me into your draw. I will be keeping my fingers crossed. I am Val from Texas. Really, I have to pick just ONE pattern?!? I would pick Brown and Pink Spring AND/OR Craisy Daisy! LOVE those!!! I would pick them because daisy's are my fave flower and my daughter's room is decorated with daisy's and the color pink and green. I am so excited and crossing all my fingers that I win! Oh, and you can bet I will be ordering some of your patterns. I love the bag! My husband and I are missionaries to SE Colorado and we travel lots- My current- craft/book bag is in shambles with the zipper just breaking a few weeks ago- how fun to tote my things around in your pretty bag! HI I am Lesley and I live in Manitoba, Canada. What a great giveaway, the bag you made is lovely and the fabric is great and what a generous giveaway. I checked out your website and have to say being partial to butterflies that Butterfly Mania would be my first choice. I also would like to know, just in case I don't win where the pattern for the bag is from as I couldn't find it on your site. Thanks for the chance to win. I'd have to go with Butterfly Mania as my pattern choice. I think it would make a perfect quilt for my daughter's new big girl room! Thank you for the chance at a wonderful giveaway!! oops- i posted on the previous blog- I did post about your fantastic giveaway on my blog! Hello, I'm Lisa from Virginia & I just found your blog the other day! I really love your quilts and the Celebrate America Kit is one of my favorites because it's patriotic & pretty! (Also, it's one I could tackle without messing up too much!) And your bag is so beautiful & I could definitely see me using it everyday. It looks just the right size for all my stuff! Anyway, I don't blog, but will keep my fingers cross that I get really lucky. Have a nice day. Hi, I'm Katie from Indiana. I really love the Autum Harvest Pattern. Why? Because I LOVE fall, it's my favorite time of the year. I would really like to win your quilted bag because my current bag is the same diaper bag I have been carrying for over 3 years and well...it is starting to fall apart. It's really embarassing. Plus, it's cute and I would be the only one in Idiana to have one like it! Thanks for entering me. First of all Chris from Alabama. Gene Black sent me here. Tomorrow I am posting this on my blog. I am also hosting a give a way. I love all the patterns but I guess Crasy Daisy or Grace is my favorite. I would be honored to have this beautiful bag. What a lovely bag. My name is Randi. I am from northern Utah. Moving to Los Angeles a little later this year...can't wait!! Oh I forgot to tell you which was my favorite pattern. You have so many cute ones, but Country Garden was my favorite!!! wow what a beautiful quilt and bag. Please sign me uop for your blog. Hi Judi! All your patterns are beautiful, but since Christmas is my favorite season, I think the Life of a Snowman is my choice! I just love that bag & absolutely must have it! I have posted your giveaway on my blog's sidebar! Thank you! Hi My name is Debbie and I live in Queensland ,Australia. I don't have a blog....yet! I am in love with Shangri-la as well, the colours are beautiful.I like all your patterns but I must say I am attracted to the pinks. "Craisy Daisy and Country Garden". The reason I think I should win the bag is simple.. The one I am using at the moment is loosing the lining if you saw it you would feel sorry for me. It looks really bad. It is not a handmade one it is just one I have that came in a set with luggage. It is very ugly. Pls PLs Pls pop me in the draw. I would be very happy to win a handmade bag. Thanks Deb. Wow...already 132 comments. Nothing like coming in at the last hour! Well, my name is Heather and I live in PA. I checked out your patterns and while I love them all, I think Butterfly Fields is my favorite! The colors look Shabby Chic, which I adore! If I win your amazing bag, I'd probably alternate uses ~ for awhile it would just be my handbag that I'd use daily. Then eventually I think I'd switch it over to use a tote for my bible, journal, pens etc ~ you know, my church stuff. :) Thanks for the chance to enter. You are very talented! Your quilted bag is beautiful and the fabric you choose is just perfect. I make purses & totes myself and am always delighted to see what others are doing and how creative they are. I'm very new to blogs in fact this is my first comment.Your work is sensational keep creating!!!!! Now you know how new I am to blogs & comments I forgot to leave my name and where I'm from on my previous comment. My name is Sandy and I'm from Ohio I'm not sure what else you need for info.Email maybe? What a generous giveaway! My name in Linda, and I'm from Ontario, Canada. I'm realtively new to quilting and would love to have some beautiful fabric to play with. The bag you made is so pretty! My favourite pattern is either Brown and Pink Spring or Craisy Daisy. Very nice! The bags are great and really do make you feel that Spring is not far away. They look like they could hold a lot and still be light to carry. I would love to own one. That is a sweet tote bag! Please enter me into your giveaway. I just found your very cute blog via Camille at Simplify. I love your bag. It's beautiful. I also really love your Judi's Album pattern. It is so nice. I'm from Ontario, Canada. And love looking at all the quitling blogs. My name is amy from Ozark. I can't decide which one is my favorite, however i am partial to that one...and the other one you did. Two of my absolute favorites. Pick me cause I can't do what you do!! I have been looking for a new church bag and this one would be perfect:) I love it. This is a great giveaway. I came over from Just another rainy day. You have a fun blog. Thanks for letting me take a peek. Hi! I love your Morning Bloom pattern and your bag made up in this fabric is beautiful - how I would love to win it!! I'd make a small zippered bag and pincushion and/or needlebook with the additional yardage - thank you for your generosity!! The tote would be perfect for quilt shows and other shopping trips, I would so love to show it off! I'm Pat and I live in Bel Air, Maryland. Mary from Quilt Hollow sent me here. I'm Kathie from Allentown, PA. The pattern I liked best was Summer's End. It stood out because of the contrast of the fabrics. I also have always like the album block, so your Judi's Album is also quite nice. I'd love to win your bag because my Vera Bradley is wearing out on the straps, and your bag would make a wonderful spring bag. With all the nice bag patterns nowadays, I doubt I'll ever buy retail again!! I love your patterns and I love your bag... my favorite I think is Rick the Rack and Dragonflys dancing. The bag is too cute and I love the fabric it is one of my favorites. Pick me! !